During PRK (photorefractive keratectomy), the surface cells of the cornea are removed instead of creating a flap as in LASIK. 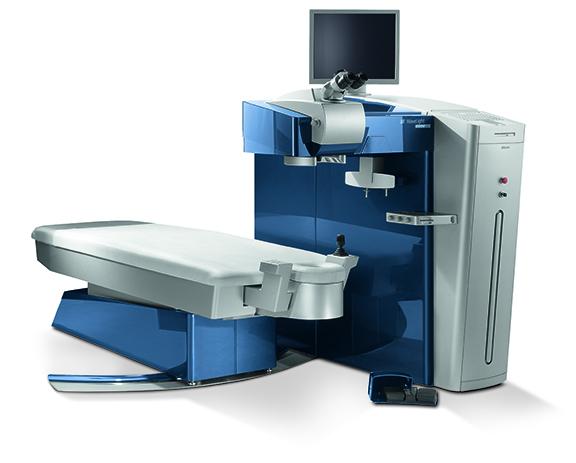 The excimer laser is used to reshape the cornea and correct vision. The vision improvements are equally impressive as with LASIK, but healing time tends to be longer. Variations in the eye’s anatomy determine whether your procedure should be LASIK or PRK. The preparation for PRK is much the same as it is for LASIK surgery. You’ll be asked to stop wearing your contact lenses for several days beforehand. You’ll also have several eye tests so the surgeon can precisely calculate the custom treatment. Immediately before the surgery, you’ll be given anaesthetic eye drops to numb your eye, and an instrument called an eyelid speculum will be put in place to hold your eyelid open. First, surface cells of the cornea are removed. Next, using an Excimer laser, the surgeon reshapes the inner tissue of the cornea with up to .25 microns of accuracy (about half the thickness of a human hair). Afterwards, you’ll rest for 2 to 3 hours with your eyes closed. Most PRK patients have mild light sensitivity and discomfort immediately after the surgery. You’ll have several follow-up appointments with your surgeon to monitor your progress, starting with your first appointment the day after the procedure. Click here to see a comparison of laser vision correction procedures. Q: How do I know if I’m a good candidate for laser vision correction? A: You’ll need to undergo a detailed eye examination. We will determine your prescription, evaluate your corneal contour using computerized pentacam corneal analysis, measure the thinnest point of your cornea, and evaluate the interior health of your eyes. Q: Can all prescriptions be treated by laser vision correction? A: All but the most extreme prescriptions are usually eligible for laser surgery. Patients that are nearsighted can usually have laser vision correction if their prescription is less than 10 diopters. Farsighted patients can usually have laser surgery if their prescription is less than 5 diopters. Q: Can astigmatism be corrected with laser vision correction? A: Yes, in addition to nearsightedness and farsightedness, astigmatism can be treated. If you have astigmatism, it means that your eye has a curvature like a football rather than a basketball. The laser will typically flatten or steepen one meridian to improve the shape of the cornea and enhance vision. Q: Is there an age limit for laser vision correction? A: It is recommended that patients be at least 21 years of age for laser surgery. This is the age at which the prescription is relatively stable. If patients have laser surgery and the prescription changes in the future, additional surgery can be performed. There is no upper age limit for laser eye surgery. As long as the eyes are healthy, patients can have laser vision correction. In fact, patients who have had cataract surgery can have laser surgery to refine their vision without glasses. Q: Are there different types of laser vision correction procedures? A: Yes, there are two main types of laser vision procedures: LASIK and PRK. With LASIK, a thin flap is constructed, the flap is retracted, tissue is removed with an excimer laser, and then the flap is repositioned. This results in a change in the contour of the cornea resulting in vision correction. The other technique is called PRK. This procedure initially involves removal of the central corneal epithelium and is followed by removal of corneal tissue with an excimer laser. A soft contact lens is worn for 5 days while the underlying epithelium regenerates. Q: Is there a difference in the final outcome between LASIK and PRK? A: No, the final visual result is the same with LASIK or PRK, however the healing time is longer with PRK. With PRK the epithelium regenerates, typically by 5 days, but it takes a while for the epithelium to smooth out in order to see well. With LASIK 99% of patients can drive within 24 hours after having the procedure. With PRK it is advised not to drive until the contact lenses are removed which is usually in about 5 days. It may take 2 to 4 months after PRK for your best vision to be obtained. A: No, most patients find the procedure relatively easy to undergo. With LASIK when the flap is created patients will feel some pressure and the vision will go dark or dim for approximately 30 seconds. The second part of the procedure is very easy. The flap is lifted, the laser correction performed, and the flap is repositioned. With PRK, when the rotary brush or polisher is used there will be a gentle pressure on the eye. The laser portion is very easy and no discomfort should be experienced. Q: What happens if I can’t keep my eye still during the procedure? A: Our sophisticated excimer lasers have devices to track your eye during the procedure. The tracking devices can rapidly follow any eye movement. Q: Will my night vision be affected? A: With advanced lasers today most patients have either better night vision or the same after laser vision correction. This improvement in the quality of night vision is related to larger treatment zones and reduction of higher-order aberrations specifically spherical aberration. Q: What are the most common risks of laser vision correction? A: The most common risks are an undercorrection or overcorrection. This can occur in approximately 2% of cases. If patients are not satisfied with their level of vision then an enhancement or refinement can be performed. Usually it is best to wait 4 to 6 months to be sure the prescription is stable. Q: What if my vision changes in the future? A: Usually the vision is stable after laser vision correction. Occasionally it can change, especially in younger patients with high corrections. This is probably not regression from the laser but rather progression of nearsightedness. If the eye is healthy and the cornea demonstrates satisfactory thickness then additional laser surgery can be performed. Q: Has anyone ever gone blind from laser vision correction? A: No one has ever gone blind from laser vision correction. The laser operates on the anterior portion of the cornea and does not affect the deeper structures of the eye such as the retina or optic nerve. The cornea is transparent and lets light into the back of the eye. It is the back of the eye that perceives light and transmits signals to the brain. Q: If I’m not a candidate for laser vision correction, are there other options? A: Yes, there are a number of different options. Refractive lens exchange is a procedure similar to a cataract operation in which the lens of the eye is replaced with a customized lens to enhance vision without glasses or contact lenses. Patients that typically are good candidates for this procedure are those with high degrees of nearsightedness or farsightedness. The other procedure is a phakic implant known as the implantable contact lens. Unlike a refractive lens exchange, no tissue is removed, and the soft customized implant is inserted inside the eye between the crystalline lens and the iris. This implant can correct high degrees of nearsightedness and astigmatism. Q: What equipment is typically used for PRK? A: Being a leader in laser vision correction isn’t possible without an ongoing commitment to the highest standards and the latest technology. The technology that enables us to consistently build on our world-class reputation is the WaveLight® EX500 excimer laser. The WaveLight® EX500 excimer laser is the fastest laser in the world today. This laser has set the standard for precision and accuracy using PerfectPulse Technology®. Its advanced multi-dimensional eye tracking capability reacts to any eye movement within 2 milliseconds, ensuring that the procedure is performed exactly the way the surgeon designed. It is equipped with Wavefront Optimized® and Wavefront-Guided treatment capability for even greater accuracy and customization of the procedure. The design of the EX500 has been refined for patient comfort throughout the procedure. It truly represents the state-of-the-art in accurate and safe laser eye treatments. Prior to surgery, each patient undergoes a series of diagnostic exams that identify the unique characteristics of each eye. This information is incorporated into your treatment plan. The WaveLight® EX500 excimer laser applies a gentle laser beam in a specific pattern unique to your eye. This advanced technology can not only significantly improve your myopia, hyperopia or astigmatism but can also improve your quality of vision such as contrast, sharpness and perception.